It's not a secret that attracting a new client is a rather challenging and expensive deal. So, to win customers' loyalty and inspire them to make new purchases are goals of high importance for every online business. One of the proven ways to achieve them is to provide flexible credit system for purchased or returned products. 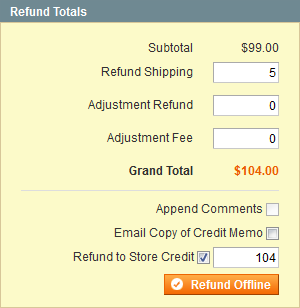 Store Credit and Refund Magento extension introduces store credit functionality that allows creating, editing and managing customer credit balance from the admin panel. Besides, the extension introduces a possibility to issue refund directly to customer credit balance in full amount and without any time delays. The credit balance accumulated on customers' accounts is always at their instant disposal, easy to track and apply. As well as for customers, using the Store Credit And Refund extension is equally profitable and convenient for store administrators. One-click refund procedure, intuitive backend interfaces and easy control over the customers' credit balances make the extension a perfect tool for delivering great customer service. Automate sending balance update notifications. Using the Store Credit and Refund extension together with the below Aheadworks products, online merchants get more valuable insights. Let customers apply store credit on the one step checkout page. One of those rare extensions that works with your system right out of the box. Definitely better than other store credit extensions I've tried. I have three aheadworks extensions installed and i couldn't be happier with the results. Vitaly and his team were very helpful and accommodating to our websites needs, i couldn't recommend them more. This wills ave you tons of time and headaches. Can be used to solve many refund and customer sat issues. 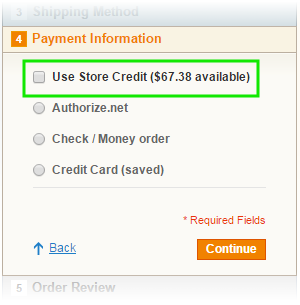 We bought this extension for one of our Magento customers who uses OneStepCheckout.com extension. aheadWorks technical support was able to make it compatible within a day and our customer is more than happy with the extension's functionality. 2 thumbs up! Good extension, works fine (as described). Intsalled and configured myself without developer's help ;) Many thanks to support team who asnwered my questions before the purchase.